All my life I have been an artist; drawing, painting, sculpting, creating. Whatever strikes my fancy at the time. Although lately I have been concentrating on customizing model horses, I have not lost my love of other fields of art. This section is dedicated to displaying some of the paintings & drawings I have done in the past. As you may notice, my forte is animals :o). I also love to paint scenery. They are not scans, so the quality is low, but you can see them at least. Enjoy! Oh, & please do not reproduce these in any way without my written permission. Thanks! Also, if you would like a portrait done of your pet or other animal, drop me a line & we can discuss it! Just click on the thumbnails to view corresponding page. These are sketches of Breyer model horses I own. I drew them in the early to mid 80s. These are couple more sketches from around the same time. These range from the mid to late 80s, possibly the last one or two from the very early 90's. This is a charcoal drawing I did in 1988 or 1989. These next several drawings were all done throughout 1995, when I carried a pocket sketchbook with me a lot & drew whenever I had a spare moment (like when co-workers pursued the destruction of their lungs in a smoke break!). These are just a few of the horse paintings I have done. All of them were painted around the same time, the early 90's were my "heyday" you could say. 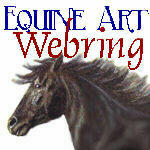 List your equine art site with us!